When you travel, you will notice that a lot of bags look alike. Only a chosen few will show a love for GeoTours! 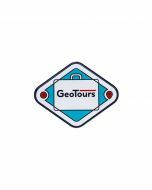 These soft rubber tags with the official GeoTour logo will help you get that Found It smilie when the airline muggles your luggage while you are traveling to your next GeoTour. 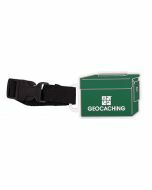 These are great to claim your geogear, and as a thoughtful gift for geocachers or FTFers. Tag measures approximately 4 inches by 2.75 inches. Strap measures approximately 3 inches when buckled.